As the summer season approaches we are often asked about what type of dog bed people should buy to take with them in their caravan. There really are so many different options. The first thing to think about is how comfortable is your dog whilst travelling to your destination in the car? 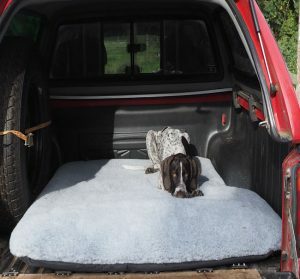 People often have bespoke mattress dog beds made for their boot of the car. These are great and can be moulded around wheel arches for it the perfect fit. 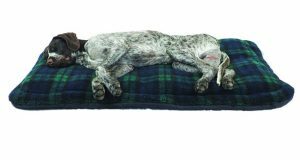 There is also a wide range of optional dog bed covers you can add to your bespoke bed for added comfort. In this picture we have a Fluffy Tuffie cover in grey. The other option for a travel dog bed is the Puppy Tuffie/ Travel Tuffie. These can be laid out in your car boot or travelling space for your dog. It consists of a thin mat made of durasoft material and is covered with a luxury fleece top and nylon backing. The Travel Tuffie can also be poppered together if needed for a smaller space. The Travel Tuffie is also a great dog bed to take to the beach or for your dog laying out on the grass. Once you get to your destination it’s time to decide which dog bed is best for inside the caravan or in the awning? Depending on the size of your caravan and the time of year there are a couple of options. In summer months when the caravan and awning can be stiflingly hot people may tend to go for a Wipe Clean Mattress Dog Bed. These are very easy to maintain as they are 100% waterproof and if they get muddy the dirt can just be brushed off and it is very easy just to wipe down with a cloth or towel if the get wet. And because they are a futon type mattress the dogs are not overly warm or enclosed. Also available for the mattress dog beds are a range of 100% cotton covers with will keep your dog cool. 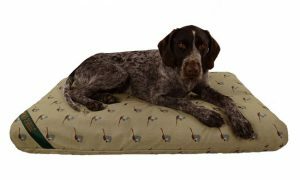 If you are holidaying in early Spring or Autumn months when the weather can be cooler and certainly in the UK very unpredictable, people tend to opt for a Wipe clean Tuffies Nest Dog Bed. When the weather is not so good this is definitely the dog bed to go for. Having high sides all the way around your dog can go in to his nest and snuggle up cosy on a cold british night excluded from any draughts. The nests have a futon type mattress cushion under them which is approx 4″ thick and encased in a waterproof fabric cover and they come as standard with a luxury fleece cover to keep warm. Nests at Tuffies can also be dressed with different accompanying products such as the Nest Sock which will turn your dog bed in to a real den or a Complete Nest Cover which will make your nest ridiculously snug and cosy. Every morning, the first thing i do when i get up is to go into my kitchen and greet my dogs. They all sleep in seperate crates with <a href="https://www.tuffies.co.uk/bespoke-service">bespoke Tuffie mattress beds</a> an..
Our Spring this year is being filled with taking a whole new portfolio of photographs for our new website. Every day we are taking a new set of photos. Once we have our range of dog beds made we take them all over from t..